In this blog post we examine various aspects of this divide between SharePoint capabilities and Business User requirements. We also highlight how solutions from MacroView can bridge the gap and and thereby deliver significantly improved user adoption of SharePoint. 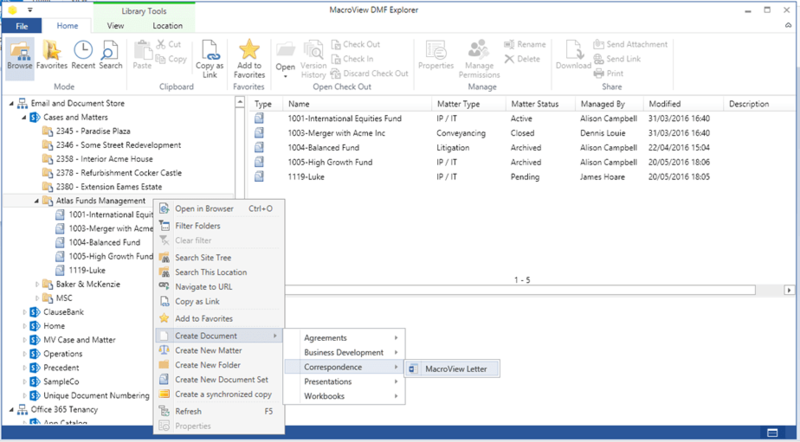 MacroView search panels allow searching for documents and emails by metadata and content, direct from Outlook, Word, Excel, PowerPoint, Adobe Reader / Acrobat and MacroView DMF Explorer. The search panels can readily be customized to reflect the metadata used by an organization. MacroView Email Search panel – note results list and preview of selected result. You can upload multiple documents to SharePoint by dragging them from any Windows folder and dropping them on any document library, folder or document set displayed in the MacroView tree in Outlook, or in MacroView DMF Explorer. Unlike the OOB SharePoint web browser UI, MacroView will prompt for metadata as defined in the destination area in SharePoint, and allow you to record common metadata for all the documents that you are uploaded. Its the same experience for SharePoint on-premises and SharePoint Online. The Create Document plug-in adds intuitive document generation to your MacroView DMF or MacroView Message solution. When you right-click a document you see a Create Docuemnt option; selecting that option displays a menu of available Microsoft Office templates. A new document will be generated based on your selected template and you will be prompted to save that new document in the area on which you right-clicked. The menu of templates is automatically built from the tree of folders in your existing Workgroup Templates area. 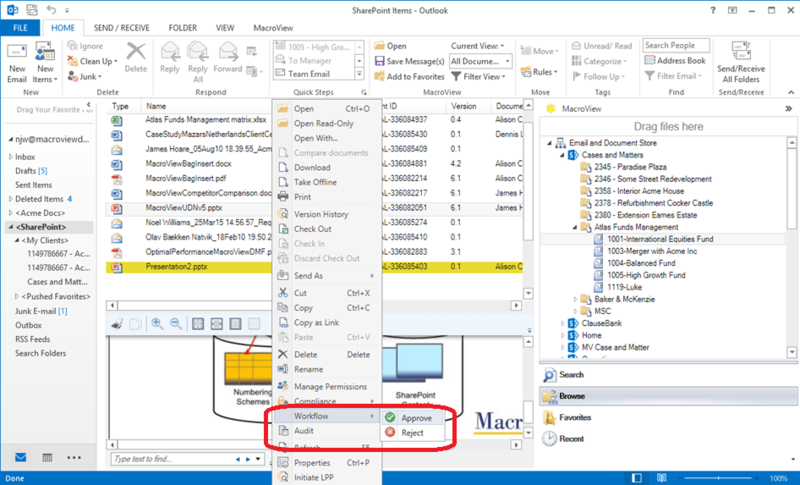 MacroView DMF and MacroView Message provide an accurate tree-view of your available SharePoint document store. 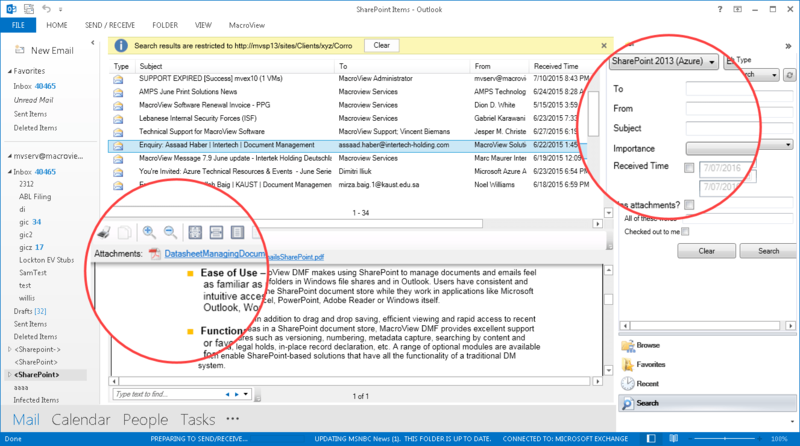 You can use that tree-view to manage documents and emails in SharePoint while you work in Outlook (and with MacroView DMF also in Word, Excel. PowerPoint, Adobe Reader / Acrobat and in a Windows application called MacroView DMF Explorer). The MacroView tree view can show the structure of multiple on-premises SharePoint applications, a SharePoint Online tenancy and hybrid combinations of these. You just need to register the web application or tenancy – MacroView will discover the areas within for which you have access permission. By displaying this complete and accurate tree-view, MacroView makes a SharePoint document store look and feel as familiar as a tree of folders in Windows File Explorer or Outlook. MacroView DMF and MacroView Message makes visualizing the structure of a SharePoint document store much easier than the OOB SharePoint web browser UI. 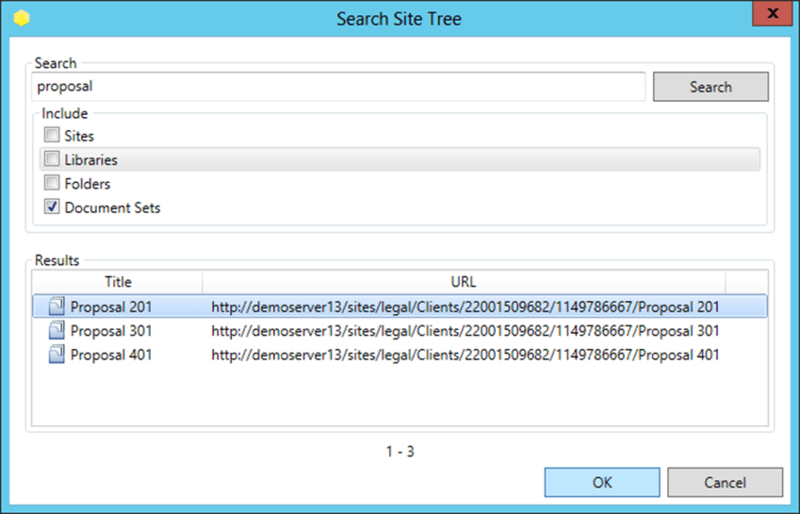 The MacroView tree view display of your SharePoint environment lets you expand and area to see its sub-areas (e.g. a site to see its sub-sites and document libraries) and click areas to navigate to them – much like you would navigate in Windows File Explorer. MacroView supplies commands that make navigating a SharePoint document store even easier than navigating a Windows file share. These commands include Search Site Tree, which lets you find and navigate to any site, document library, document set or folder using part of its name or title. MacroView lets you use drag and drop or Cut and Paste to move a document between areas in SharePoint. The source and destination areas can be in different site collections, or even in different web applications. You can also move between on-premises SharePoint and SharePoint Online. As it moves a document MacroView can re-use existing metadata and maintain existing version history. MacroView displays the same Profiling (metadata capture) dialog in all applications, for all types of documents. That MacroView Profiling dialog supports all the type of metadata column that ship with SharePoint. 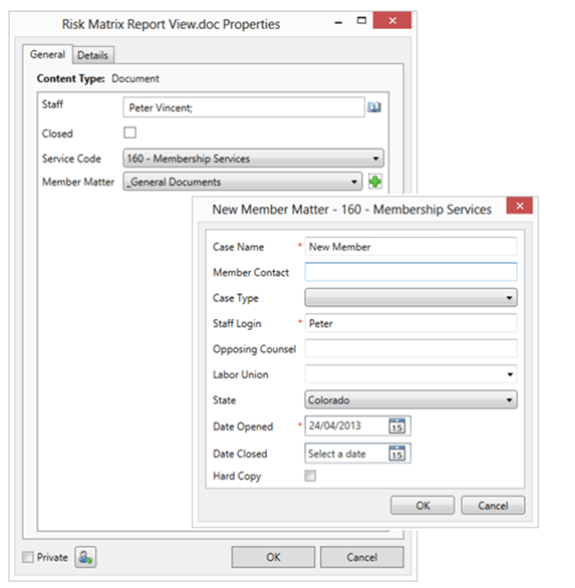 The MacroView Profiling dialog can be customized by MacroView Professional Services to support custom field types and to provide an enhanced user experience for editing metadata columns. MacroView Profiling dialog customized to have a button for creating the record for a new Project in the organization’s CRM system. With MacroView DMF and MacroView Message you can save one or multiple attachments to SharePoint in a single drag and drop action. You will be prompted for any metadata that is defined in the destination SharePoint area, unless MacroView can record that metadata automatically. Any metadata that you supplied for the email will be automatically applied to the attachments. If there are multiple attachments you can opt for all of them to have the same metadata. Any characters that are illegal in SharePoint filenames will be removed automatically and the original unstripped file name will be remembered so that it can be re-instated when the file is later retrieved from SharePoint and inserted as an attachment in a new email message. The menu that displays when you right-click a document in a MacroView file list can readily be customized to include a Workflow option. By selecting Workflow a suitably authorized user can conveniently advance the document in its workflow. The sub-menu items can be customized to reflect the definition of the workflow. The Workflow option will not be active for users who do not have appropriate permission levels to update the workflow. The example below shows a custom Workflow option with sub-options Approve and Reject. Custom Workflow option added to the MacroView right-click menu. For on-premises implementations of MacroView DMF an optional module called Enhanced Document Security (EDS) lets you to make a sensitive document My Eyes Only and provide specific access permission to selected other users or groups of users. This works for Contribute level users – you do NOT need assistance from an Administrator to apply these permissions. If the MacroView UDN optional module is installed, the footers of Word, Excel and PowerPoint documents that are saved in SharePoint will automatically be updated to display the Document Reference details – e.g. unique Document ID and current Version Number. In on-premises implementations the unique Document IDs will be numbered sequentially across the whole SharePoint document store – just like a traditional DM system. Document Reference displayed in the footer of a Word document as it was saved to SharePoint. As you close a document MacroView AOI provides the version control options that are familiar to users with previous experience of a traditional DM system. 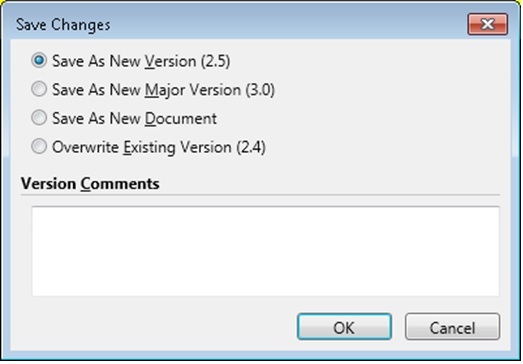 This allows replacing an existing major version and and prevents the accidental discarding of changes that have been made to the document. MacroView solutions bridge the gap between what SharePoint provides OOB and what Business Users need for managing documents and emails. MacroView solutions let Business Users work in the applications they prefer to work in, such as Outlook, Word, Excel, PowerPoint, File Explorer & Adobe Acrobat. MacroView solutions refine and extend the DM functionality of SharePoint to the point where it meets the needs of the most demanding users – e.g. 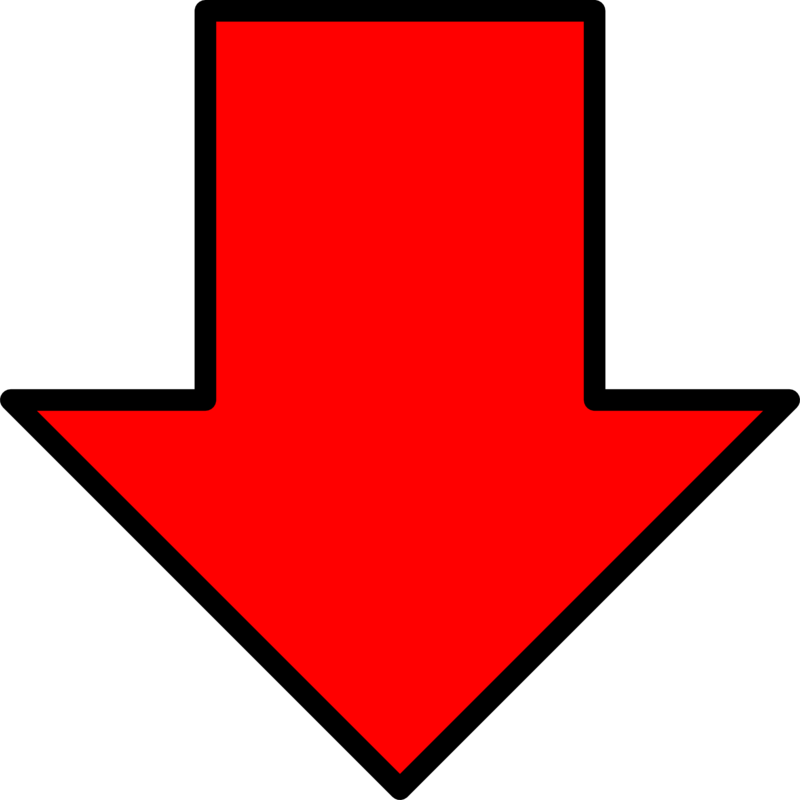 users in a corporate Legal department or law firm. By dramatically improving the user experience for managing documents and emails, MacroView solutions deliver significantly improved user safisfaction with and adoption of SharePoint. Click the button below to request a free evaluation of MacroView DMF or contact MacroView for more information.